During the Researcher’s Night event, we were approached by Deutsche Welle for a short interview on the objectives and achievements of MAMEM. During this interview we had the opportunity to talk about the futuristic objectives of MAMEM and explain how far we have reached in their accomplishment. Of particular interest for the reporter of Deutsche Welle has been the hazards that may derive from a technology that is able read our minds, although we re-assured him that we are still very far from such a scenario. Read the full article (in greek). 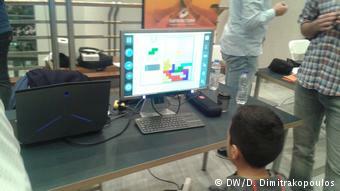 PreviouslyMAMEM @ Researchers’ Night, inviting kids to play TETRIS using their eyes and mind!